The flowerpieces of the 17th century, even before the ‘tulipmania’ of the 1630s, heroized the tulip for its gracefully form, brilliant colouring, and feathery stripes (induced by a virus in the bulb). Decorative arrangements by artists such as Bosschaert, Francken and Andries Daniels presented the tulip as monarch, crowning displays of every imaginable flower. Today the tulip is cheerful, cheap, and no longer a status symbol; however, it is still one of the most beautiful and balletic of flowers, with its sheaves of drooping foliage, curving stems and chalice-shaped heads. This painting makes sensuous use of the abstracted forms and colouring of tulips, setting the brilliant contrasts of scarlet, yellow, apple green and blue against a starkly white dish & glossy black ground. It is close, in its use of saturated colour, to Fantin-Latour’s jewel-like Citrons, pommes et tulips in the Hermitage, St Petersburg (a vase of red tulips against a velvet black ground). 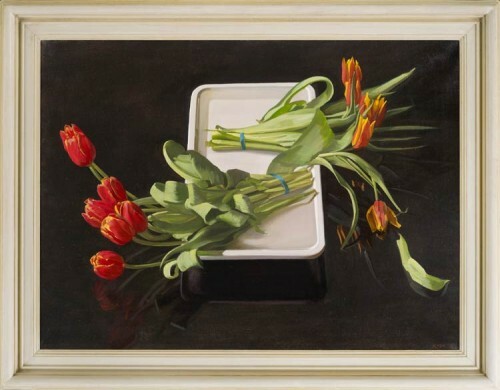 But that work is still a celebration: Rose’s tulips are not celebratory – they loll on the clinically white dish, imprisoned by the elastic bands which have bruised and broken the foliage. Fantin’s tulips are immortally fresh; Rose’s are helpless in a coffin-shaped container, at once the symbol of youth and an elegy to the transience of life.